ChemChibi wrote: Good morning to everyone! Yes, that was absolutely right! Welcome, ChemChibi, and thanks for your picture. 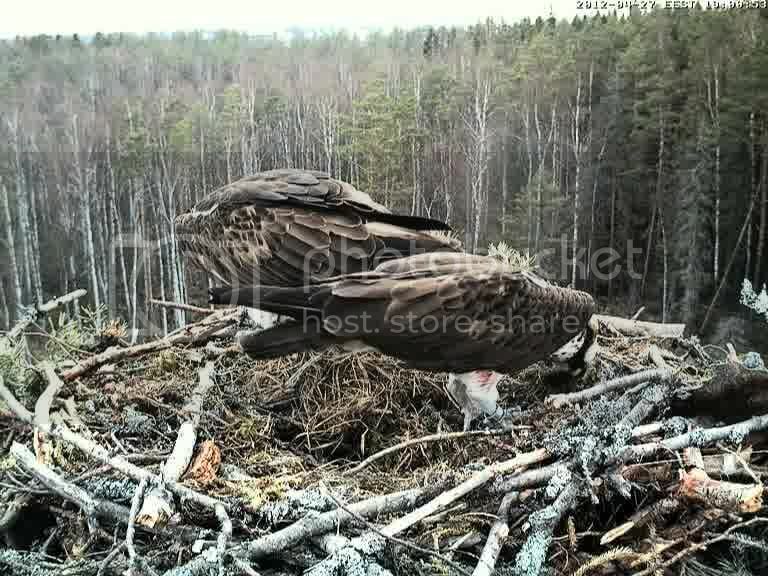 Yesterday at 17:20 the male's right tibia looked all white (the first 15 seconds). About one hour and a half later (at 19:00) there was something red on it. A wound, someone else's blood or some paint? Is it blood from the fish maybe Its certainly the 'best' aanswer. I'd hate to think he was injured. The nest is empty just now. Thanks to all (especially Nancy) for interesting information you found and shared? 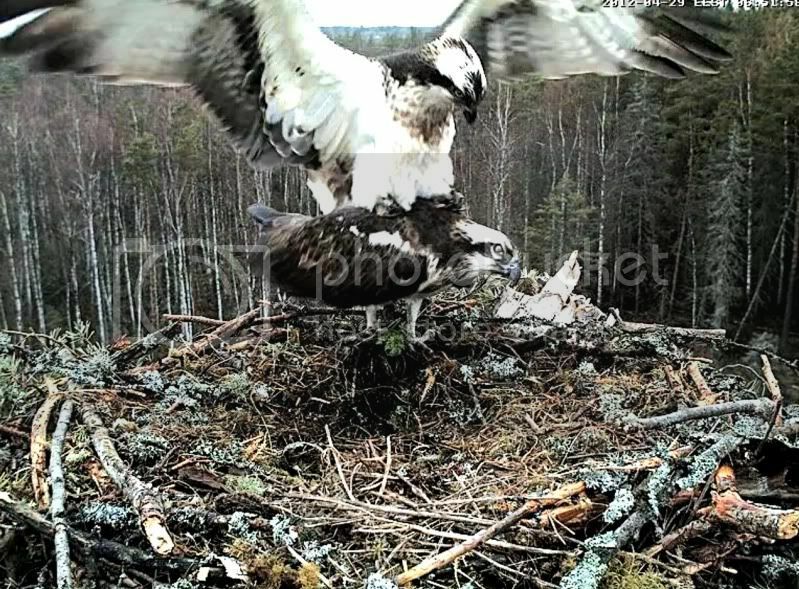 By my knowledge (based on Erikas tracks during several years) the female should stay after arriving near the nest, but that is not the case here... I don't know if its some wrong thing here or simply diversity of behaviour? Hello Urmas! thank you for the information on the male's leg - I had not noticed that before. All together we make a good team of watchers here ~ the birds do not read the books so we have to learn from observing them. There is no one in the nest at this time. Ospreys are monogamous and are strongly faithful to their nest and their mate. They tend to build their eyries on top of large conifers. The nest is large and made of branches and twigs and lined with small twigs, moss, bark and grass. It takes both birds 2-3 weeks to build is usually around 1.2 – 1.5m high and 0.5m deep, but with the addition of extra material over the years this can increase. 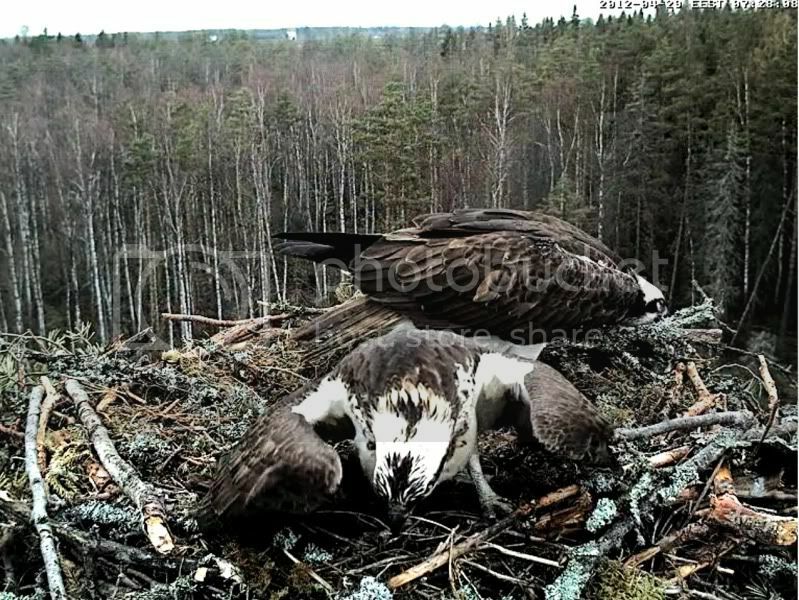 The female will lay 2 or 3 eggs at the middle to end of April which she will incubate for 37 days. 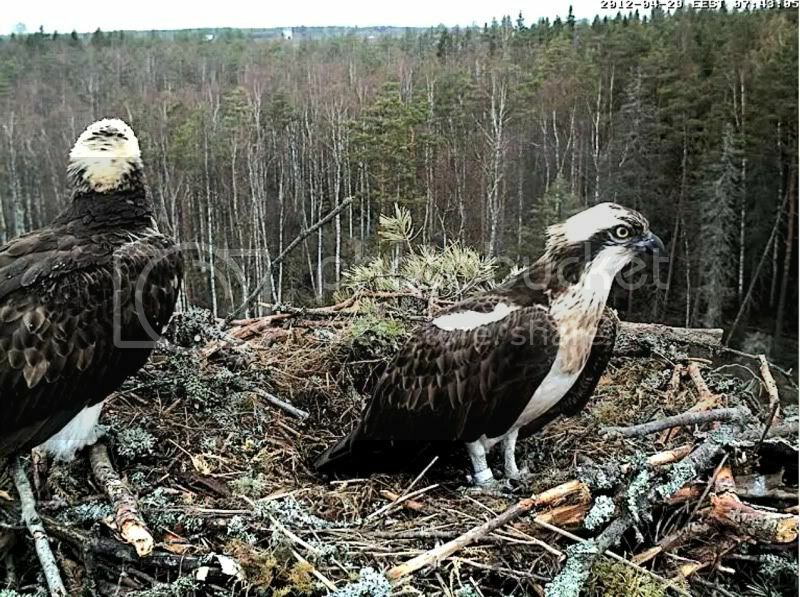 As with other raptors, the chicks usually hatch a few days apart. 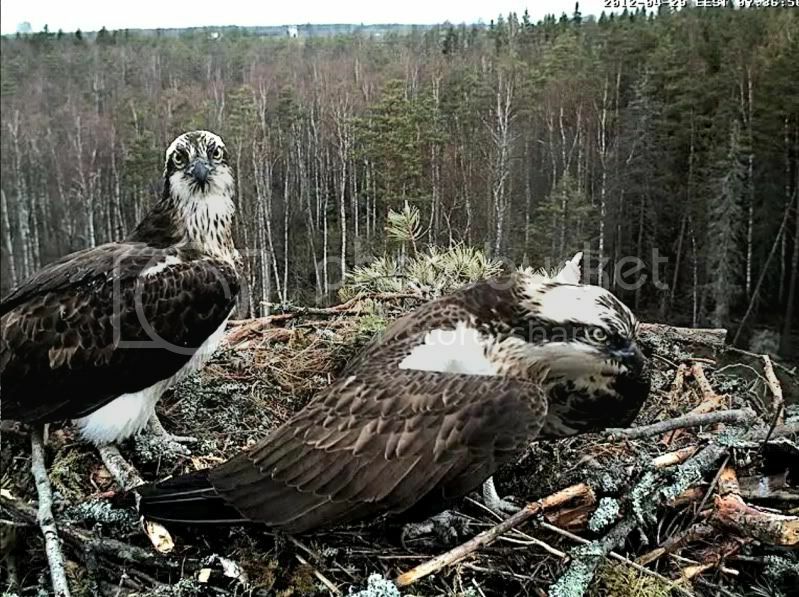 Nesting duties are clearly divided: the female carries out incubating, brooding and direct feeding of the young and guards them throughout nesting; the male is the major provider of fish for the female and their young. 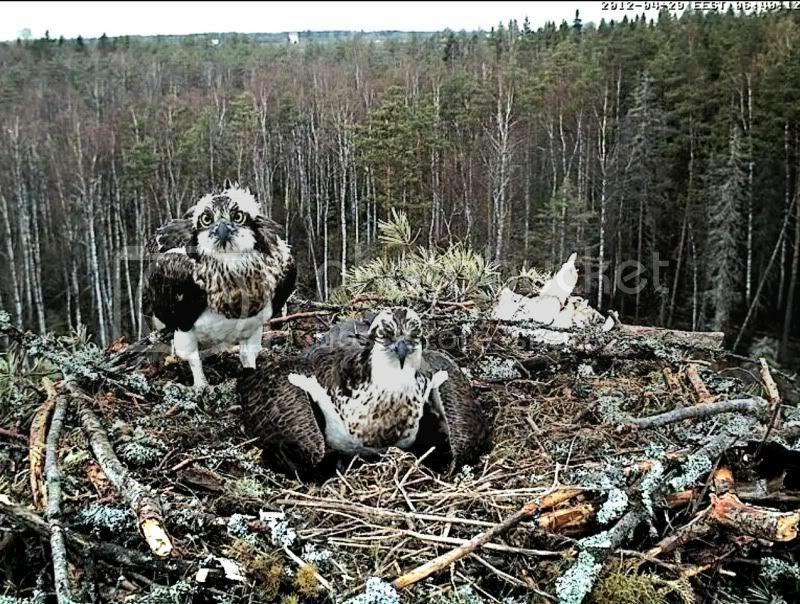 The chicks will fledge at 53 days and both parents will feed them. They stay close to the nest for another 2 months. 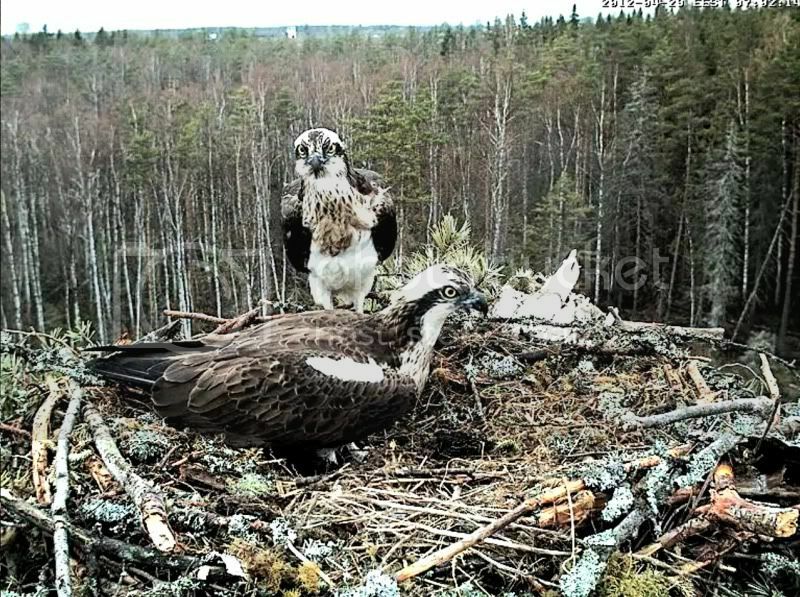 Many juvenile birds die before they are 3, while the average life span of an Osprey is around 8 years – the oldest known Osprey, however, lived for over 30 years. Well,thats not helpful either but if this nest was previously unoccupied there may be (are) several fmales laying claim to it. 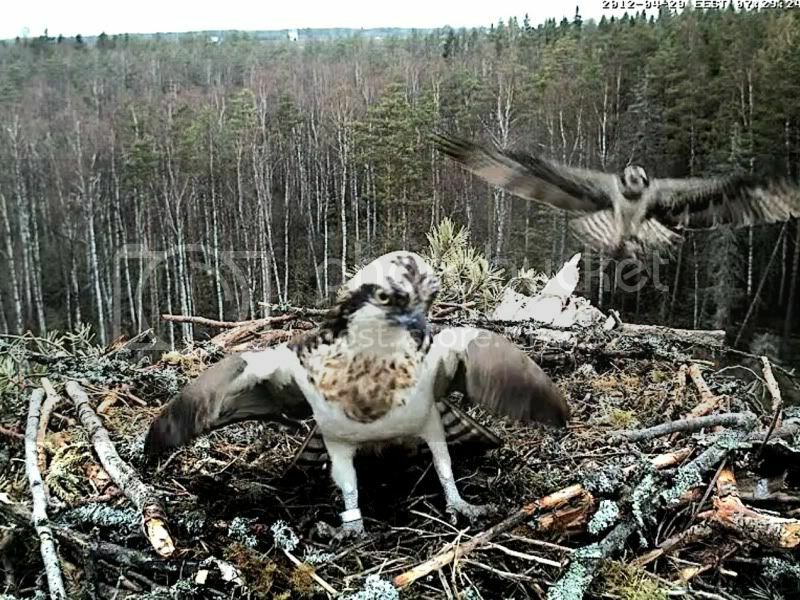 "It mine".."No its mine" and so on until the supposedly stronger,older Osprey claims this nest as hers.. I do wish they would make up their minds. Urmas,thank you for the info about the injury. If he was more busy he may forget about his scratches ? I rushed through the pontu pictures for today - it seems there were few visits, but they were brief. Very shortly after this image (while I was "playing" around trying to save this) I think there was a mating or attempted mating. This just a bit later. 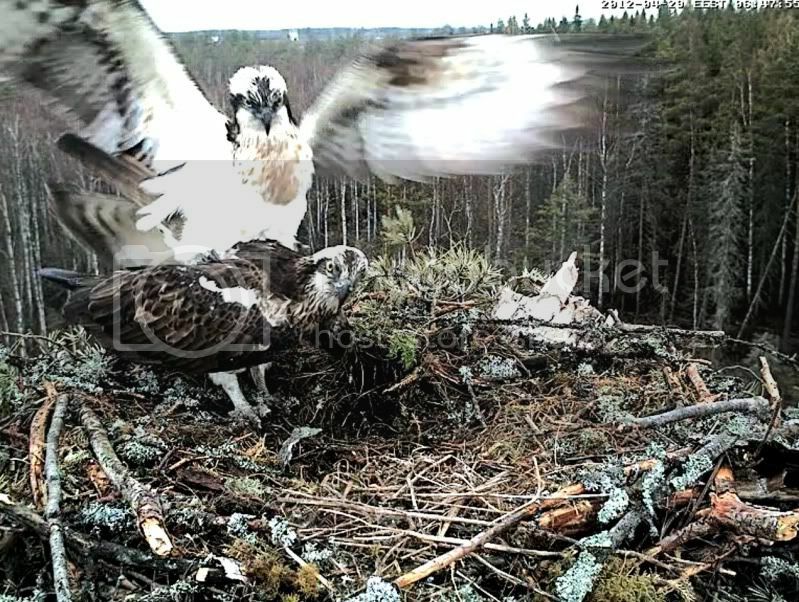 Possibly there is an other Osprey around? 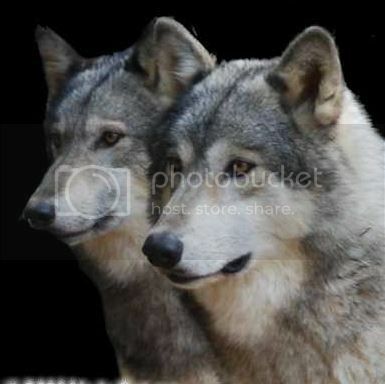 The both seemed to be looking out into space and I thought I heard calls that were not from the nest -- but I have to admit I have trouble with their calls, they often do not seem to come out of these beaks. Very shortly after the previous picture, the female took off and flew around the edge of the trees we can see and then she flew back to the nest. hi, alice! I have been watching this nest this morning - i *think* this is the regular male and the most recent female. I have seen seen (5-6) "matings'" so far this morning (Sunday, April 29). 6:47 the male brought a fish for the female. She started eating it at the back of the nest, but then dragged it over to this edge of the nest - you can see it in her left foot. He mated and she went back to eating. The male arrived with a branch and the female flew off with the food item in her foot. The male moved some branches and worked on the nest. It's really interesting to keep this cam open! I think there are still several eagles fighting for this nest, or several ladies fighting for the man, I don't know! Coming and going, shouting, looking, flying off ... coming back, immediately taking off again! I have lost track of who is who and when, and with whom!